Suspect Charged with Assault & Battery on a Police Officer after Biting an Officer’s Thumb at the Booking Desk: On Tuesday, August 7, 2018, officers assigned to the District A-1 (Downtown) Neighborhood Drug Control Unit conducted a drug investigation at Chinatown Park, an area known for high drug activity, in the area of Surface Road and Essex Street. While surveilling the area, officers observed an individual, described as a black male wearing a grey Nike T- shirt and blue jeans, twirling a plastic bag containing what officers believed to be illegal drugs. To corroborate and better understand their observations, officers approached the individual in question. Upon seeing the officers, the suspect quickly stuffed several small individually wrapped plastic bags, believed to be heroin, into his mouth. However, officers were able to recover two of the bags; one which had fallen to the ground and a second found inside the suspect’s hand. When officers attempted to take the suspect into custody, the suspect began to physically resist and fight with the officers. Eventually, officers were able to subdue the suspect and transport him to District A-1 for booking. Once at the station, the suspect continued to disrespect and disparage the officers. At one point, after spitting at several officers, the suspect bit the thumb of one of the arresting officers. The officer was treated for a non-life-threatening injury. When asked to explain his behavior, the suspect stated, “He got too close so I bit him." Officers charged James Turner, 31, of Boston, with Possession with Intent to Distribute Class A Drug (Heroin), Resisting Arrest and Assault and Battery on a Police Officer. The suspect was additionally charged with Trafficking Class B Drug (Crack Cocaine) after a plastic bag of illegal drugs, about the size of a golf ball, was recovered off his person at the booking desk. 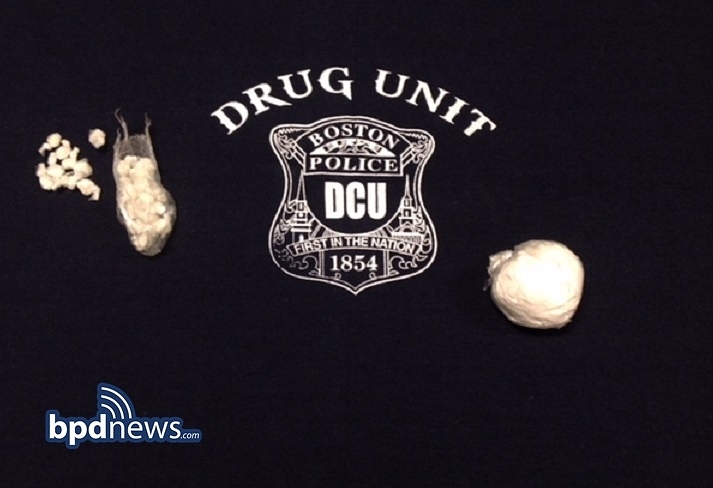 The recovered bag contained 29 small plastic baggies of crack cocaine.